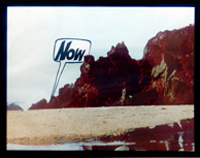 Best known for her presciently provisional approach to painting, the versatile artist exhibits two groups of found landscape photographs altered with one-word speech bubbles (“Now,” “Wrong,” “More”), to amusing, if abstruse, effect. Several related images appear in a slide-show “retrospective” in a companion exhibition at the downtown gallery On Stellar Rays, which is focussed on Feinstein’s new paintings. A few incorporate doppelgängers to play with ideas of originality and reproduction. The most striking example is a black-and-white diptych involving diagonal stripes and nearly identical photographs of the same pair of cats. Hanging in the gallery’s office are four versions of one image, including a canvas made by a copyist named Yin Xunzhi, in the Chinese village of Dafen. Through April 27.